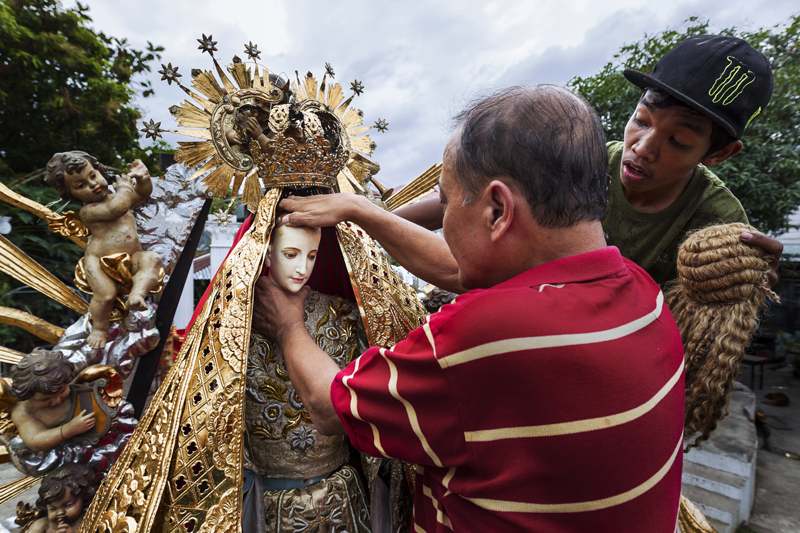 MALOLOS, PHILIPPINES, JANUARY 2012: Dez Battista, an expert on religious icons in the Philippines, prepares his "Nuestra Senora Reina del Ciela," (Our Lady of Heaven," for a religious procession in the streets of Malolos, Philippines. The Icon has head and hands made of solid Ivory, these pieces were comissioned by Mr Battista 15 years ago. This is post Ban Ivory and it is unknown whether this work is made from illegal ivory, of which there is a great deal in the Philippines, mostly used for the carving of religious iconography. The procession will feature 200 similar icons, many of which are made of recently carved Ivory.